Sylva Foundation CEO Gabriel Hemery reports on significant progress made in bringing the English forestry sector together to ensure that forestry practice, and our trees and forests, will adapt effectively to climate change. The challenges we face in the light of climate change are familiar to us all, in every area of society. In relation to our trees and forests, and within the forestry sector, it is well-accepted that we need to take action to adapt to a changing climate. The UKFS (see box right) clearly articulates key measures we should be implementing, but how well are we meeting the challenge? The second moment was the response by 1,500 stakeholders to a national survey concerning ‘awareness, action and aspiration among Britain’s forestry community relating to climate change’. Responses to the 2015 British Woodlands Survey indicated that the resilience of the UK’s forests is currently poor, although there are a number of positive aspects which could be built upon. The report concluded that collaboration across the sector was required, with responsibilities shared between the many interests. It also identified that risks need to be more clearly communicated to stakeholders, together with firmer, tailored, guidance on addressing these risks. Together these two moments secured both the willingness to collaborate strategically, and the evidence necessary to measure progress towards meeting the adaptation measures in the UKFS. The next step was to build on these by agreeing what actions needed to be taken. What could we do better (or less of)? Priorities: what we need to do, by whom, by when? Steps 1-3 formed the basis of a Draft Action Plan (see Read More), yet to address the important steps of what we should improve, and our priorities for taking action, it was necessary to convene a stakeholder workshop. 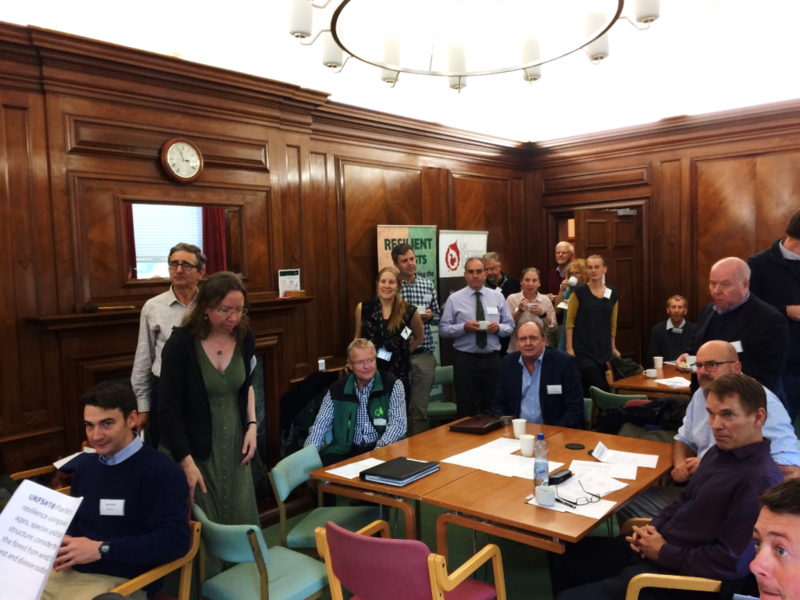 At a meeting held on 11th October 2017—hosted by Forest Research at Alice Holt Lodge—senior representatives from 24 organisations (see box) gathered to devise strategies to tackle steps 4 and 5. BIFOR, Confor, Deer Initiative, Egger, Euroforest, Forest of Marston Vale, Forest Research, Forestry Commission England, Forest Enterprise England, Future Trees Trust, Grown in Britain, Institute of Chartered Foresters, Lockhart Garratt, Martin Glynn, National Forest, National Trust, Natural England, Royal Forestry Society, Small Woods, Sylva Foundation, Tubex, Tilhill Forestry, Woodland Heritage, Woodland Trust. After an opening address by Forestry Commission Chairman Sir Harry Studholme, an introduction to the FCCWG by its Chairman Simon Lloyd (Chief Executive, Royal Forestry Society), and an overview of the changes ahead from James Morison (Climate Change Science Group Leader, Forest Research), delegates were soon hard at work. Gabriel Hemery and Gill Petrokofsky, both from Sylva Foundation, managed the café-style brainstorming. Small groups tackled each of the 18 UKFS factors in turn, identifying priorities for action over the next five years. Preparing for the next brainstorm session. Photo Gail Atkinson. Over the next few months the FCCWG will be reviewing the outcomes of the October workshop. We aim to publish, in early 2018, an Action Plan for Forestry and Climate Change Adaptation. We intend this to be a rolling five-year plan, which will be reviewed annually to assess how well the sector is progress in meeting the agreed actions. Given the degree of commitment shown by organisations to date, we are confident that the actions will be widely adopted and responsibilities shared among stakeholders. The FCCWG is keen to hear from those who may be interested in being actively involved in its work. In particular, we are aware that the interests of tree nurseries, timber processors, and urban forestry are under-represented. Ultimately, we are hopeful that the unprecedented collaboration across the sector, together with the sound evidence behind its collective action, will help ensure that the Action Plan is embraced by forestry policy-makers, will influence the commissioning of relevant research, and will empower practitioners to take action. Dr Gabriel Hemery FICFor is Chief Executive of Sylva Foundation, and a member of the Forestry and Climate Change Working Group. Hope some attention is given to commercial requirements. Species substitution may work in the forest but not always in the workshop.